A beautiful crocheted baby bobble afghan is the best gift for your little one or for any new babies. 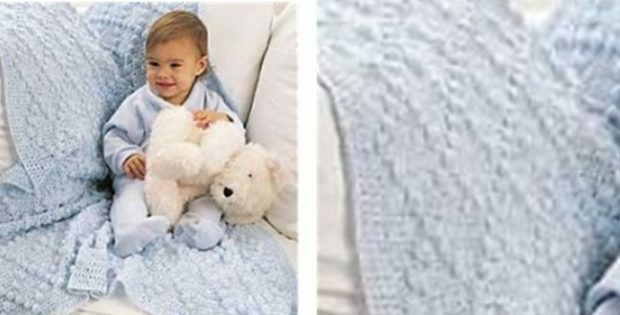 As a matter of fact, this afghan is the perfect size and pattern for a child’s bedroom. The design features playful ripples and bobbles, and the baby blue color is cheerful without being overwhelming. This pattern is so easy to follow that a confident beginner crocheter can make this. Once completed, the beautiful baby blanket should measure approx. 34 inches wide by 48 inches long. Do you prefer metric measurements? The blanket should measure about 86.5 cm wide by 112 cm long. A very cool and beautiful crocheted baby afghan, from Yarnspirations collection of crocheted designs. Get this FREE lovely crocheted bobble baby afghan with adorable colored design patterns. This pattern comes in both an English, Spanish and French version. Featured image(s): Yarnspirations – thank you!